Perfect for Electrical Warning labels, Chemical Hazard labels many other areas where there is a need to clearly mark products that pose a danger or need to convey information to the user. We offer two solutions low cost or high durability. Graphic Overlays are 2 layer labels featuring a hard wearing top surface. Overlays maybe any shape and may include any number of apertures (cut outs) . 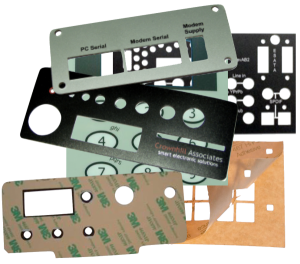 Typically used for front panels and top covers where knobs buttons dials and switched protrude through the label.Overlays typically have a textured mark resistant finish. We offer a comprehensive service including -if required special colour matching. Graphic overlays can also be directly laminated to panels and we can supply front panels manufactured from aluminium, steel, FR4 and Printed Circuit Boards. Materials are CNC manufactured to your design. Our graphic overlay panels are made of a laminate material that has the look, feel, and durability of traditional silk-screened panels but without some of its limitations. The graphics panels are a minimum of 125 micron( 0.125 millimeters) thick which we have found to be most versatile when laminating Aluminium and FR4 front panels. The material is a wear resistant cadmium free monomeric calendered PVC film that has the look and feel of satin lexan, and even though they are prototypes delivered within days, they are virtually indistinguishable from the production labels that you may see on your telephone, HiFi, or other high volume devices. How do your Graphic Overlays compare to Screen printing? Our graphic overlay panels (labels) provide you many advantages over silk screening: for one they are considerably less expensive for prototyping and production, the are also available in virtually any of the 16 million colours in the CMYK Pallete, you are not limited to the color the silk screen printer has on hand. With our digitally printed process there is no smearing or chipping. Your product can have any image or graphic in high definition full colour. Anything you can create in Corel or Photoshop can be digitally printed on your panel! How durable is the graphic panel? We can manufacture your graphic overlay from any CMYK color. Unless you specify white, we will normally produce the overlay using a base material that matches the colour of the underlying product. Thus panels with a small amount of printing on them, appear to be made of the same material as the product. See example photographs. What Shape can the overlay be? Your graphic overlays can be any shape you desire. The outline of your graphic overlay is cut by our automated cutting system directly from the outlines you indicate in your graphics file. What about cutouts for connectors? We can cut any shape you define in your design file. 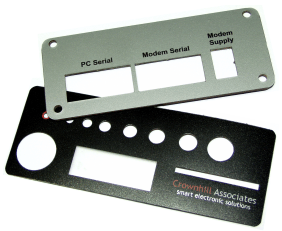 Over sizing your cutouts by .2 - .5 mm larger then the matching faceplate cut out (e.g in the case of a connector) simplifies the installing of connectors etc. What Graphics file format do you require?